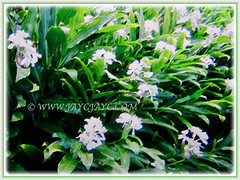 Butterfly Ginger Lily or Garland Flower is a widely cultivated garden ornamental and as a source of cut flowers. It is considered invasive in many regions of the world, namely Japan, Philippines, Mauritius, South Africa, Mexico and Hawaii, to name a few. Hedychium coronarium is the National Flower of Cuba where it is known as mariposa, literally ‘butterfly’ due to its shape. Botanical Name: Hedychium coronarium (syn. : Hedychium lingulatum, Hedychium maximum). 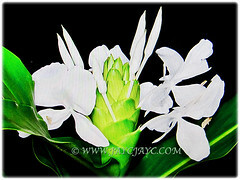 Common Name: White Ginger Lily, White Ginger, Butterfly Ginger Lily, Garland Flower. Etymology: The genus name Hedychium is a combination of the Greek adjective edys and chion meaning sweet and snow respectively, with reference to the fragrant and white colour of its flowers. The specific epithet coronarium comes from the Latin word coronarius, of crown because its flowers are used as garlands. Origin: Native to India, Nepal and Bhutan, Laos, Myanmar and Thailand, China (Guangdong, Guangxi, Hunan, Sichuan, Yunnan) and Taiwan. Plant type: A rhizomatous and perennial flowering plant. 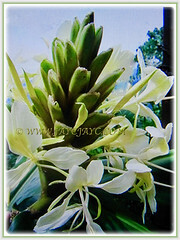 Features: Hedychium coronarium is from the genus Hedychium that comprises of approximately 70-80 species. A fast-growing perennial and upright herbaceous plant that grows between 1-2.5 m tall, arising from creeping underground rhizomes close to the soil surface. Its 0.5-2 m long pseuduostem is erect and unbranched. 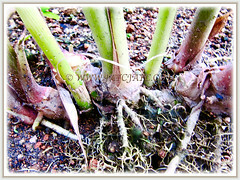 Fleshy rhizomes are 2.5-5 cm in diameter and strongly aromatic. It is able to form dense colonies. Evergreen leaves are 30-60 cm long and 10-15 cm wide, oblong to lanceolate and narrowed to a slender point. Margins entire with midrib prominent on dorsal face. Smooth and glabrous on both surfaces, glossy and coloured bright green. Sessile leaves are arranged alternately in two opposite rows along the stalk. 2-3 cm long ligules are membranaceous. Inflorescences are terminal and singular, presenting a series of bracts partially overlapping. Bracts ovate with acute apex, 4-5 cm long. 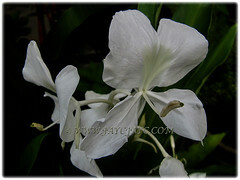 Its highly scented flowers comparable to jasmine emerge from between the bracts, 2-3 flowers per bract. The butterfly-like showy flowers are zygomorphic and hermaphrodite, coloured white with a yellow tinted lip. Cluster of flowers are located at stem’s terminal. A long white filament arises through the corolla and bears a single anther at its apex. Its bright orange to golden seed pod or fruit is an oblong capsule, 2.5-3.5 cm long, that dehisces when mature, releasing numerous red seeds. Seeds are ovoid, 6 mm long and 4 mm wide. Seeds are covered by a bright red aril. 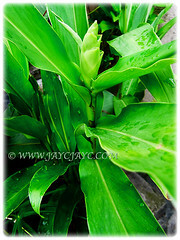 Culture (Care): Hedychium coronarium or Butterfly Ginger Lily grows easily with least maintenance. Moisture: Lots to moderate water requirements. It grows well in shallow water. Others: The plant is invasive in shallow water systems, along streams and in waterlogged areas in the tropics and subtropics. 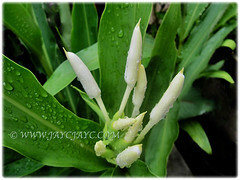 Hedychium coronarium or Butterfly Ginger Lily can be found in warm subtropical and temperate regions. It is a herbaceous perennial that grows in warmer climates but may also be grown in mild winter temperate regions of North America and Europe where it dies back in winter but re-emerges in spring. It’s not very hardy and tolerates temperatures down to about -2°C. This beauty is susceptible to severe frost. It favours waterlogged habitats with high temperatures all year round. In non-hardy regions, grow it in a container to easily overwinter as a houseplant with bright light. It flowers from late spring to early fall with the stalks topped with clusters of wonderfully fragrant white flowers that resemble butterflies. Propagation: Propagated vegetatively from parts of rhizomes. It can be propagated by seeds too and best sown as soon as it’s ripe. 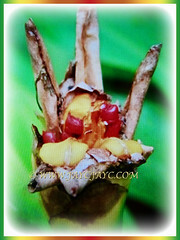 The red aril attached to a seed attracts insects which may disperse the seeds. 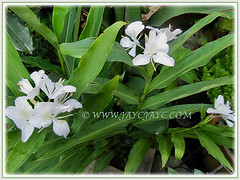 Usage: Hedychium coronarium or Butterfly Ginger Lily are popularly grown for its ornamental foliage and fragrant flowers. Its attractive flowers make it a desirable ornamental plant that’s excellent for container gardening or grown in the ground. Young buds and flowers are steamed and eaten or used as a flavouring. The mashed stem is used to treat cuts and swellings while the ground rhizome can be used to treat fever. Seeds are aromatic and used to relieve flatulence problems. 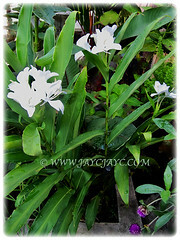 Traditionally, the rhizome and stems are used to relieve headache. The aromatic essential oil from the flowers is used to make perfumes, soaps and other cosmetic products. The native Hawaiians use the juice of mature seed head as a shampoo and conditioner for hair. 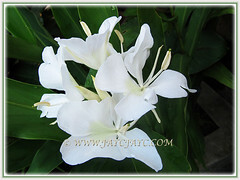 Grow this beauty that produces highly fragrant flowers and use them as cut flowers indoors to scent your living room.